Willie's BBQ loves to take its grub on the road. 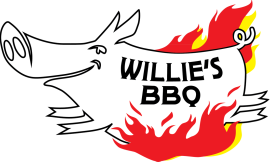 Willie brings his smoker to local events such as the Farmer's Markets around the state and events such as Yankee Doddle Pop, Clive Festival, Urbandale Carnival 4th of July and many more events. Contact us to find out where we'll be next! Willie Downing is a Southern transplant with a passion for cooking. A passion that runs so deep some might say he needs a 12-step program for his addiction to cooking. Willie isn't your typical cook. He's a master with the grill. Here in the Midwest, good BBQ is a dime a dozen. You can get a decent rack of ribs or brisket sandwich in many restaurants in Iowa. However, good just isn't good enough for Willie. "Oh my goodness, that was amazing" is the reaction he desires in his customers, not just "that was pretty good". Willie takes a "southern smoke" approach to his cooking. Like a doctor with his patients, Willie takes good care of every piece of meat served. Get ready for flavors that will make your mouth happier than when it received its first kiss. Willie offers high-quality catering services and can help spice up any event. We service small, large, and medium sized groups. Our catering prices are affordable but, most importantly, your guests will be happy.